It has been a historic year for British Cycling, with Team Sky winning all three Grand Tours for the first time! Such success doesn’t come by chance, it was the result of detailed planning and dedicated hard work. Geraint Thomas the winner of this year’s Tour de France shared insights from behind the scenes this morning at a London Sporting Club event in Soho’s L’Escargot. Alexander Charles Associates was delighted to bring 20 valued clients and 4 members of the British Heart Foundation to this networking event. Thomas was full of humour as he recounted the teams’ adventures at this year’s Giro d’Italia, Tour de France and Vuelta a España, and how Team Sky strategized their successes. This included the value of teamwork (which in a multi-week race cannot be overstated), the importance of being able to rely on others, and making detailed preparation for everything from the race courses and riders diets, to team motivation and needs of individual members. These strategies are equally applicable to success in any the business arena; each department within a business, from sales to accounting, needs to work synergistically to achieve success for the whole company. Alexander Charles Associates are especially pleased to have invited representatives from the British Heart Foundation (BHF), our Charity of the Year 2018-2019. The networking breakfast was a great opportunity to meet key members and learn more about the important work which BHF does. Ian Stafford of the London Sporting Club, very generously presented the BHF with a Pink Jersey signed by Chris Froome the only British winner of the Giro d’Italia, this will be auctioned to raise vital funds. 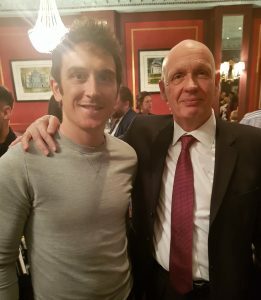 All attendees also received a copy of the brand new book “The Tour According to G” with a personal dedication from Geraint Thomas.